Lillard could lock up a quarter billion this summer. Portland Trail Blazers All Star point guard Damian Lillard is reportedly interested in signing a supermax contract with the team this summer, according to ESPN's Brian Windhorst. It shouldn't really come as a surprise that he'd be interested in such a move, considering he could be in line for a $250 million deal. 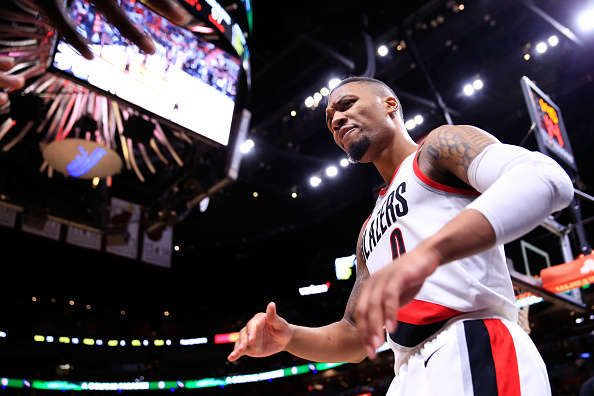 Windhorst reports that Lillard, 28, is reportedly feeling "very settled" these days and he's "very comfortable with his commitment to the Blazers," despite some previous concerns about the direction of the franchise. Lillard, who has spent each of his first seven seasons in Portland, will be eligible to sign a lucrative supermax contract extension this summer if he makes an All-NBA team. He is currently averaging 26.4 points per game to go along with 6.8 assists and 4.6 rebounds. "Lillard has two years and $60 million left on his deal. If the Blazers offer the extension -- and they are likely to -- he could add four years and $194 million to create a six-year, $250 million commitment." "The signs are pointing toward Lillard being interested in a Blazers extension offer this summer. Unlike other stars such as Kawhi Leonard, Paul George and Anthony Davis, who asked for trades instead of signing the supermax, Lillard has sent signals that he's interested in locking up a quarter of a billion in the days leading up to his 29th birthday in July." With nine games remaining in the regular season, the Blazers are currently sitting in fourth place in the Western Conference with a record of 46-27. Portland has been playing without CJ McCollum as he nurses a lingering knee strain, and they'll be without Jusuf Nurkic the rest of the season as a result of the devastating leg injury he sustained earlier this week.